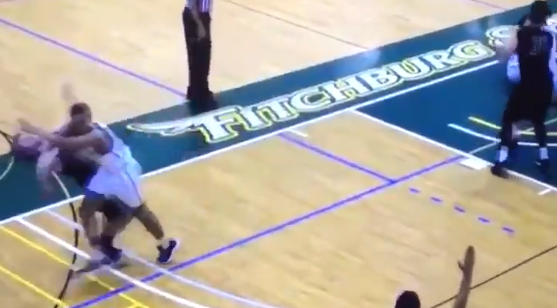 On Tuesday, the Fitchburg State men’s basketball team hosted the Bison of Nichols College for a non-conference game, and it would not go without incident. A player on Bison was all set for a three-pointer in the corner at some point during the game, but well after he released the ball, Fitchburg star Kewan Platt came in with a vicious elbow/clothesline and sent him down to the ground. Crazy thing about this is, Kewan Platt was just selected Massachusetts State Collegiate Athletic Conference (MASCAC) Men’s Basketball Player of the Week. He is currently averaging 24 points, 12.5 boards and 1.5 assists per game.